Last time Draco, Portia, and Artemis headed off to France. Draco met his wife to be and Portia completed her LTW of 10 boyfriends. With her LTW completed, I release her into the “life stream”. She’s free to pursue all the romantic relationships she can… while not cluttering up the house. Have fun out there, Portia! It’s apparently the time of leaving in the legacy house, because later that evening, Crazy Pants Diana begins to feel… tingly. 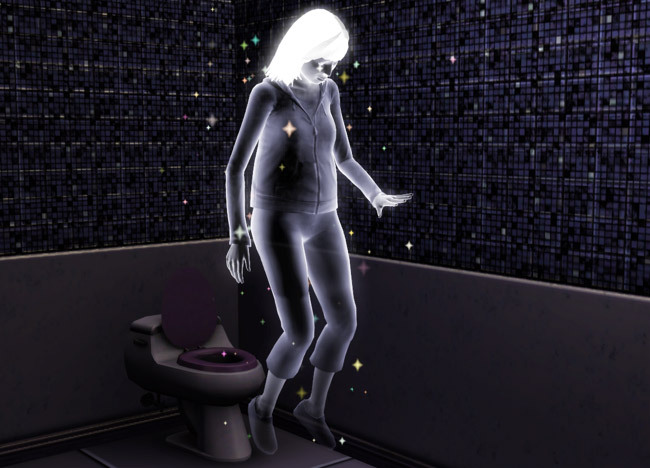 Suitably enough, Death comes for her in the bathroom. She’s spent many years yelling at the toilet and bath tub… hell, she’s even been caught screaming at the walls! It’s like delayed bathroom revenge or something. And the same night Margot gets that “tingly feeling”, too! Death really had his hands full. At least Margot gets a send off, though, even if it looks rather, well… uninspired. I promise you that seconds after this picture was taken, everyone was weeping. It just took a moment or two for it to sink in. Now you get to hang out at the cemetery with Crazy Pants! Needing to get away from all the sobbing and crying going on around the house, Draco spirits off to France by himself. He gathers up Noémi and they have a quickie-type wedding outside of his newly purchased vacation home. That makes two homes down, one more to go! Of course, he still needs to go through Egypt for his LTW. The newlyweds settle into a comfortable routine of companionship. Most of their conversations seem to revolve around whose arms are beefy like Trogdor’s. I guess that’s what being an athletic sim is all about. Noémi isn’t happy to just settle with normalcy, though. She has to stir things up. Scaring the crap out of poor Artemis is one of her favorite pasttimes. Sorry, Artemis… can’t stand in the way of love! Don Juan, I think… just ignore him. He’ll disappear into the background eventually. 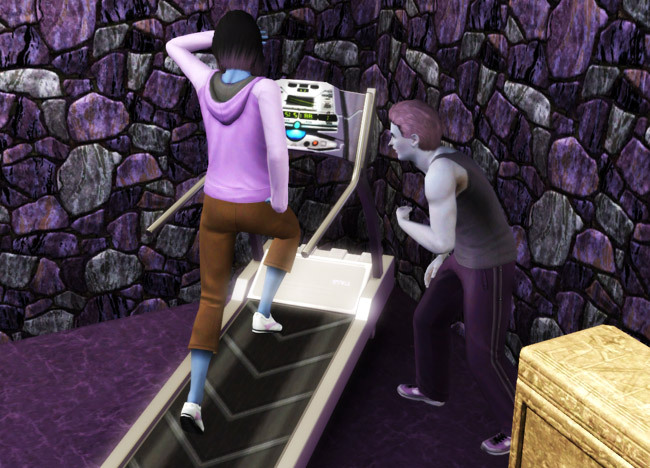 With so many athletic sims in the house, it’s like having a 24/7 gym downstairs. Draco puts his knowledge to good use by training Bellatrix, who is in sad need of it. For being an athletic sim, her athletics skill is woefully low! Awww, RIP Crazy Pants! You brought much amusement to the Astrum house! LOL, Margot was unimpressed with it all, even in death! I wonder if Youssef will wear Noémi down eventually or if we are to be treated to the spectacle of him being rejected time and time again. I still haven’t tried that woohoo in the theatre option. I only ever seem to get “Tour” as an option, which is total boringness. But yay for a baby! 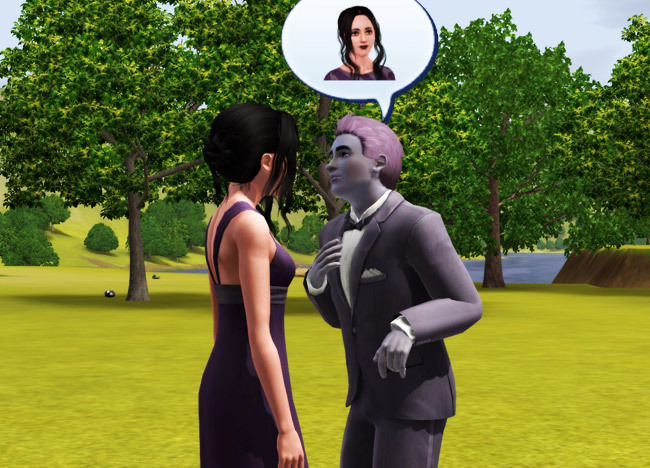 I bet a purple-skinned legacy founder would have had a much easier time passing on genes in TS2, where the genetics system actually makes some semblance of sense. 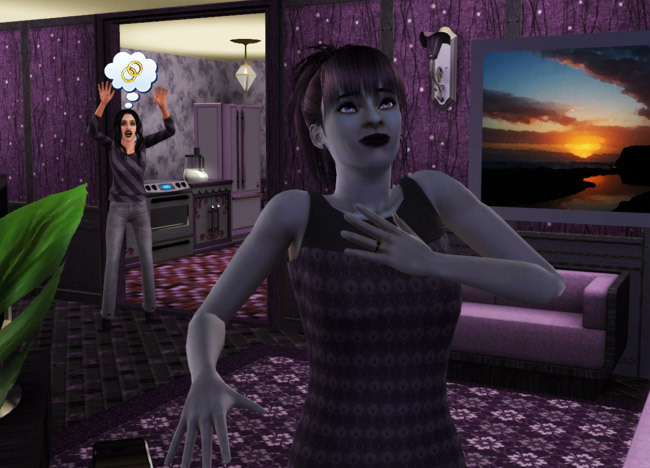 I’m yet to figure out what the hell is going on with genes in TS3. I am going to say that with the way things are going, Youssef and Noémi are going to end up enemies… which will amuse me endlessly! 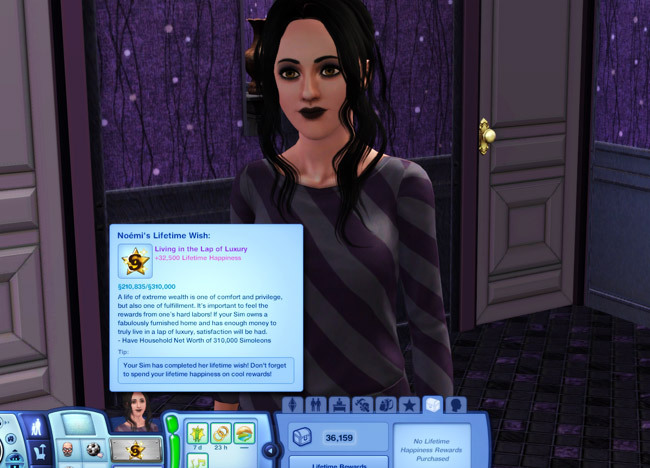 I don’t usually have “mean” sims in TS3. You have to tour the theater with two sims to get the woohoo option. It’s pretty lame–music and confetti over the theater. Woohoo. 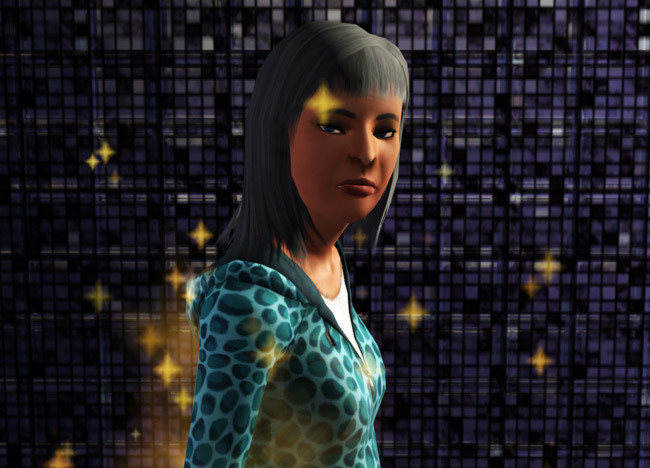 TS3 genetics are like the worst slightly randomized thing ever. Awww, I’m gonna miss Crazy Pants. She was a great source of amusement. Maybe Youssef is just missing her too, that’s why he is hitting on Noémi, for memories sake…….blah, who am I kidding. This is Youssef we’re talking about, lol. I don’t think I know of a simmer who isn’t haven’t issues with their game, and waiting for a patch is pointless. It seems EA is to busy money grabbing to worry to much about it. In all honesty though, would the patch even work!. Seems like all they do these days is bork the game even more…..*sigh* I give up on EA. I gave up on EA a long time ago, but I’ve played their other games, too. They have become such a money-grubbing company, it’s only going to get worse before it gets better. Worse yet, they are buying up and absorbing good companies and turning them bad… which is what happened to Maxis. LOL! Youssef is such a dog. Phoebe is actually just plain pale. The game likes to trick me. That’s the normal shade of blue for heir/heiress babies, though. And yes! It is getting a LOT harder. I don’t really care if they’re male or female, so long as they have all of Astra’s original physical colorings–bah! I haven’t updated, either. I haven’t even installed the Loft Stuff thing. Not that it’s much worth it, anyway. I like my CC too much and I’m not about to use that stupid store. Sob, death of Crazy Pants. :’( I will miss you and your insane antics and general interest-causing weirdness. Man, it’s so annoying that the game shows babies as being one color, and then then change later on! What a glitchy nightmare that is. I’m annoyed on your behalf, lol. 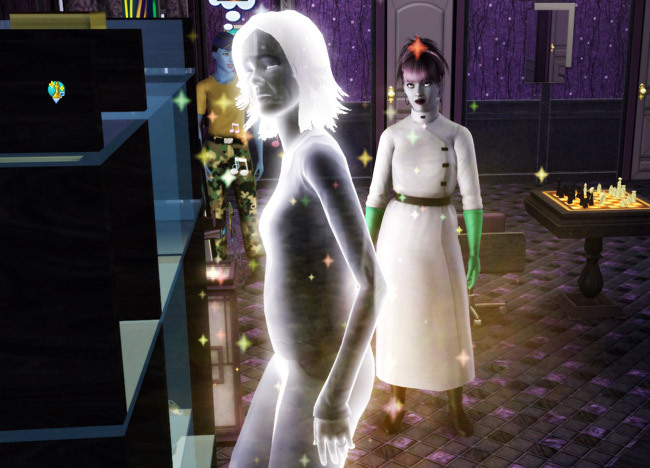 The painting gallery looks awesome: that’s one thing I’ve never been able to achieve in sims 2. I always sort of crap out after one or two portraits. Fun update! Moémi almost has as cute a little chipmunk face as Margot! Hahaha, yes, Crazy Pants will be missed! And you’re right, it’s super annoying. I wish it would stop toying with me! I wish portraits looked better and were more predictable in TS3. The game seems to randomly decide how zoomed in they are or how to crop them. Phew. Have just spent entire day catching up with your blog. SO much has happened, cant believe already gen 5, I totally loved Crazy Pants and woah those blue kids are so blue, bet u glad you did not choose Jupiter for your heir. I have never got any of my sims to fulfil their LTW, something I am yet to do, so I enjoy seeing your sims doing it. Was such a fun reading, and glad i had some time to catch up (sometimes having a cold is a blessing) . Haha, hey Speechless! No worries, I’m super behind lately, busy with lots of stuff in RL. Should get back to updating soon, though. Glad you got caught up!